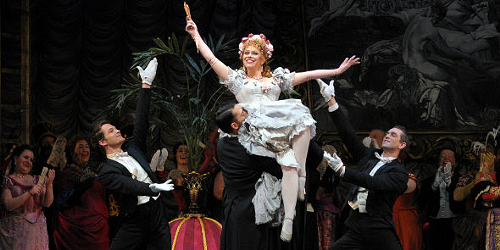 Then get yourself over to Lyric Opera for a delightful Viennese holiday treat, Johann Strauss Jr.'s Die Fledermaus. Don't speak German, but treasure faithfully rendered versions of 19th-century operettas? For the rest of us, this traditional, all-in-German production—nicely directed, richly cast with top-flight comic actor-singers, beautifully played and sung by the Lyric Opera orchestra and chorus, and dropped into an enchanting if Disney-ish world of cartoon sets and frilly costumes—is a bit like a watching a silent film. It isn't opera—there's a bunch of possibly snappy spoken dialogue. And while the talking's going on, 3,500 pairs of eyes are on the supertitles. As the excellent program essay by Eric Myers points out, Fledermaus was daringly modern when it was first produced, and has attracted a lot of updating and other tinkering since. I'd like to have seen Max Reinhardt's 1929 Berlin version, for example, which starred notable nonsinger Cary Grant when it moved to New York. Or the one that was choreographed by George Balanchine on Broadway in 1942. Since the euphoric Strauss score can pretty much be counted on to carry the whole frothy, errant-husband concoction (drunk jokes and all), playing it in the language the audience speaks seems like a minimal risk. New York's Metropolitan Opera will open a new all-English production, with dialogue by playwright Douglas Carter Beane and lyrics by Jeremy Sans, on New Year's Eve; Susanna Phillips, an alumna of Lyric's Ryan Opera Training Center, will play Rosalinde. Lyric's Die Fledermaus continues this week with shows at 7:30 PM Wed 12/18 and Sat 12/21; a second run begins January 10; 312-332-2244, lyricopera.org. Theater Arts Music Lyric Opera of Chicago Die Fledermaus Metropolitan Opera Susanna Phillips Douglas Carter Beane Jeremy Sans Johann Strauss Jr.